Artec is introducing a new solution for the fashion and e-commerce industries. 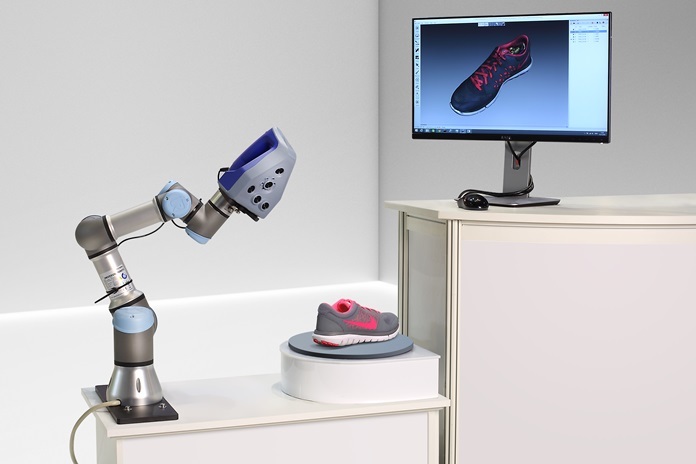 At the footwear tradeshow WSA @ MAGIC in Las Vegas, we’ll be showcasing RoboticScan, the brainchild of Artec’s hardware and software engineers that 3D digitizes items automatically. You can use RoboticScan to create an online catalogue of products in 3D so customers can view them from all sides and in high resolution. RoboticScan is a new 3D scanning setup consisting of a Space Spider precision 3D scanner manipulated by a robotic arm, UR3. Put an object on RoboticScan’s rotating table and let the scanner capture it from different angles. The software will direct the scanner ensuring no areas of the surface are missed. Given that most of the workflow is automatized, this solution saves a great deal of man-hours, producing high-quality 3D models. Along with RoboticScan, WSA @ MAGIC attendees are welcome to have a go at scanning objects with Artec’s handhelds Eva and Space Spider. Thanks to the use of high-grade electronics, these scanners capture the geometry and texture of objects with utmost precision, and Artec Studio 11 scanning and processing software makes sure the data collected is aligned and fused in the most efficient manner.